Office management isn’t exactly an area most startups tackle, but Pingboard, which is launching in beta today, aims to become “an office manager’s best friend.” The company argues that it’s the first really modern service that was built for office managers. Pingboard also announced today that it has raised a $1.25 million funding round. While enterprises have often developed their own solutions, Pingboard says, it wants to become the go-to office management solution for small and medium businesses and startups. The company says these still tend to rely on seldom-updated spreadsheets (we’ve got a few of those at TechCrunch as well) and manual processes. 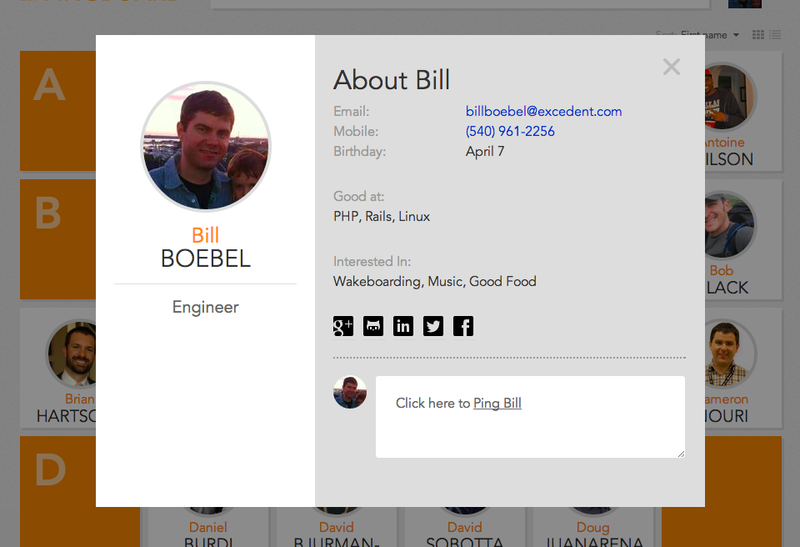 Pingboard, on the other hand, stores all employee information in a single place. The service also offers an API, so companies that need to connect their directory to more complex applications and have the resources to do so can expand the service to meet their own needs. Indeed, while the company is starting out with this directory service, it does see itself as a platform. It’s starting out small because it believes that having the core directory data allows it to then power more interesting use cases. The team says this could be anything from powering company lunch orders to getting into human capital management. Over the long run, that’s where the Pingboard team believes the real value of its service will be. “We are launching focused on the employee directory first because virtually everything that needs to be automated in an office centers around employee information,” the company told me. As part of the core service, Pingboard includes some basic messaging functionality (using email or text messages) so employees can easily notify each other or receive notifications from their office manager when they have a visitor or a package has arrived for them, for example. All of the data in the system can be imported from spreadsheets and auto-synced with Google Apps, social profiles and HR systems. The service also allows users to sign in with the Google Apps accounts. The service was founded by Bill Boebel (CEO) and Rob Eanes (CTO). Boebel is an Austin-based angel investor and part of Capital Factory, together with OtherInbox founder Joshua Baer and WP Engine founder Jason Cohen. He previously built Webmail.us, which was acquired by Rackspace in 2007. He stayed with Rackspace until 2011. The project was incubated at Capital Thought, an incubator founded by Boebel, Baer and Cohen. The lead investor in Pingboard’s funding round is Silverton Partners. Baer and Cohen also invested in this round, as did Webmail.us founder Pat Matthews, Rackspace funder Pat Condon, Indeed.com founder Rony Kahan and RightScale founder Jonathan Siegel.